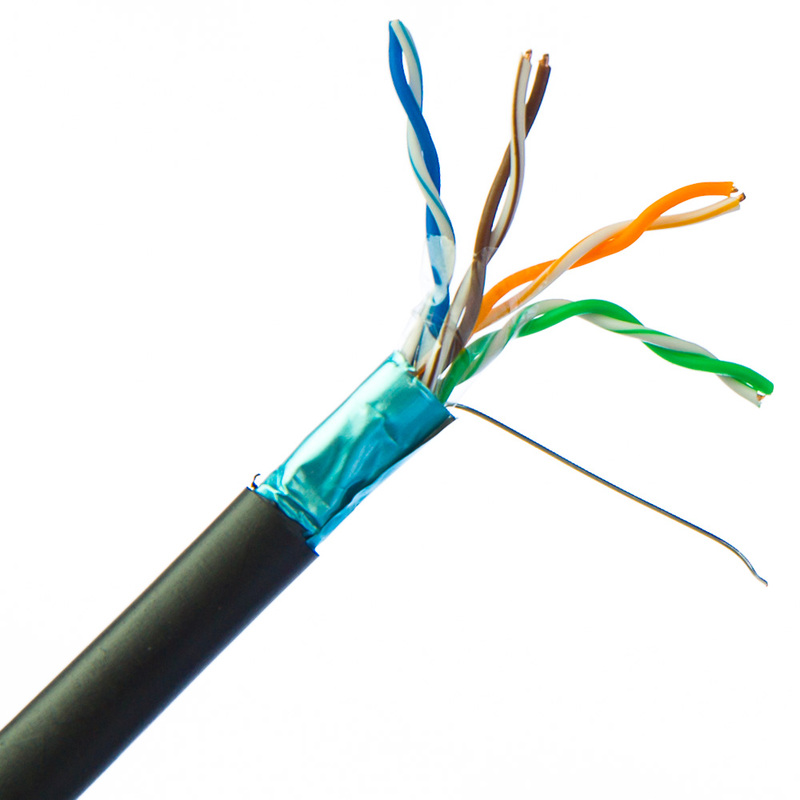 Perform high data transfer rates for large network infrastructure projects with our bulk, 1000-foot solid CMX Cat6 Ethernet cable. This solid Cat6 comes in a convenient, easy-to-use spool that is rated for direct burial/outdoor-rated. It has a AL-foil shielding to reduce or eliminate electromagnetic interference (EMI) and bare ends on each side - it is ready for any project you may have. Our high-performance cable's conductors are 23 AWG solid bare copper that provide for the best signal possible and exceed the EIA/TIA-568-C standard. Shop CableWholesale for all your data transfer, networking and phone line needs. Please note that this cable is very thick and is intended to be punched down in to a keystone jack or patch panel. We will not guarantee any connectors will work with this cable due to the thickness. Excellent cable. Thick outer jacket, made of high quality PE. Real AL foil shield...not aluminized mylar. Product will present a challenge when using RJ45 connectors...I recommend the Platinum Tools EXO-EX44 RJ45 connectors with external ground used in conjunction with the EXO-EX crimp frame also made by Platinum Tools. The results will be good, as the EXO-EX 44's with external ground handle overall cable OD of 7.75mm and this cable specs to 7.30mm. The conductors (plus insulation) will also fit in this RJ45 connector. Generally, however, you will want to terminate this cable from keystone jack to patch panel (both need to be shielded for this cable to work as intended). The cable is constructed as follows from the outside-in: 1. Spline 2. 4 twisted pairs of 23AWG solid conductors 3. Polyester (plastic) wrap over the spline/conductors 4. ESD drain wire 5. AL foil shield 6. Outer PE sheath This cable does NOT use dry waterproof cloth tape nor is it gel filled, so I would be hesitant to direct bury this cable. I would use conduit for this situation. 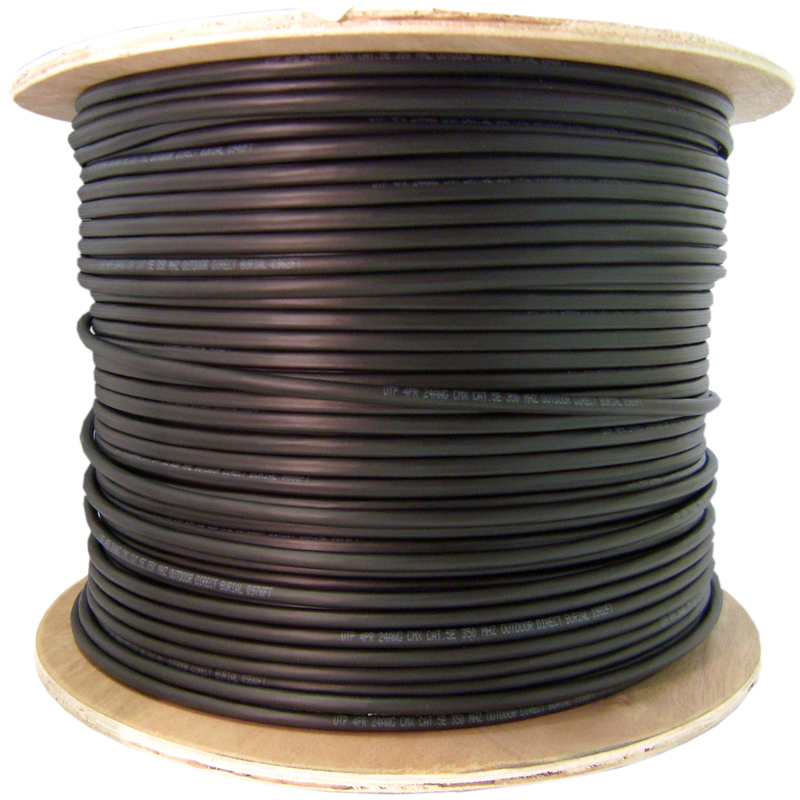 For any other outdoor application, this cable is extremely suitable. CableWholesale had just what I was looking for with Direct Burial Shielded Ethernet Cable. Plumber was about to close trench to my new shed and I needed this cable FAST! Amazon and other online retailers had this cable but shipping prices were 2X-4X as much AND they couldn't promise 2nd day delivery. CableWholesale came through with excellent shipping pricing and the spool arrived on time and as promised! I will be doing more business with CableWholesale in the future! Exactly what I needed. Works great with punch-downs and sure will stand up to the weather. I am using this for an installation on the ocean and with LOTS of power lines around it. Worthwhile. Customer service was the best.